The role of FDG PET CT in thyroid malignancy is not clearly established. Malignancy of the thyroid remains poses issues very different from the squamous carcinomas of the upper aerodigestive tract where PET-CT is usually used. Though this is the most common endocrine malignancy, many a times it is difficult to diagnose malignancy in thyroid nodules. The biology of well differentiated thyroid cancer, medullary carcinoma, poorly differentiated carcinoma and anaplastic carcinoma varies significantly and management strategies differ dramatically. FDG PET can be used as a wonderful tool in thyroid malignancy for selected indications. 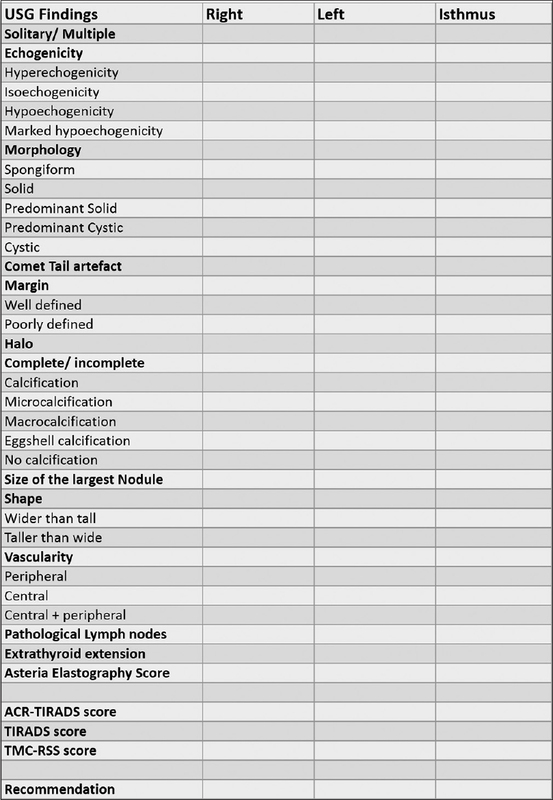 A number of qualitative and quantitative ultrasound (US) risk stratification systems for thyroid nodules are being used all over the world, new ones are being devised but so far, no consensus on a single system has emerged. Efforts by the worldwide medical community involved in the management of thyroid nodules are converging toward US risk stratification systems, which could provide a high-sensitivity and high-negative predictive value (NPV) for the diagnosis of clinically significant thyroid carcinomas. In this article, we review the fascinating journey of thyroid US-based thyroid imaging reporting and data system (TIRADS), the changing trends in TIRADS and emerging stratification systems to assess the risk of malignancy. Our recommendation is to develop a comprehensive system of risk stratification which incorporates clinically relevant as well as radiological risk factors and aims to accurately predict the risk of malignancy and oncologic outcome for each patient. Introduction: Eagle's syndrome (ES) is defined as the elongation of styloid process or the calcification of the stylohyoid ligament causing clinical manifestations such as throat pain, odynophagia, dysphagia, headache, and irradiation of pain into the ear and neck pain. The clinician misses the diagnosis due to nonspecific clinical presentations. Objective: To study detail clinical profile and management of the patients with ES in a tertiary care teaching hospital of eastern India. Materials and Methods: Twenty-one patients with ES were included in our study. Diagnosis of the ES was based on clinical presentations and three-dimensional computed tomography (3D CT scan). All were treated through transoral approach under general anesthesia. Results: 3D CT is very useful for preoperative estimation of the styloid process length. There were no postoperative complications encountered. Chief symptoms of the patients were regressed after surgery. Conclusion: Clinical presentations and three dimensional CT are important for exact diagnosis of ES. The transoral approach is a safe and definitive treatment of ES. Background: We know from the existing literature that perineural invasion (PNI), lymphovascular invasion , and depth of invasion (DOI) are important prognostic factor that influence locoregional control in oral squamous cell carcinoma (OSCC). However, there is a lack of robust data in literature to recommend adjuvant treatment when one or more of these soft adverse factors are present in early stage OSCC. Patients and Methods: All treatment naïve, early OSCC who received definitive treatment in the form of surgery in the institute between March 2010 and December 2013. The clinical and demographic details, histopathological features, and follow-up details were collected. 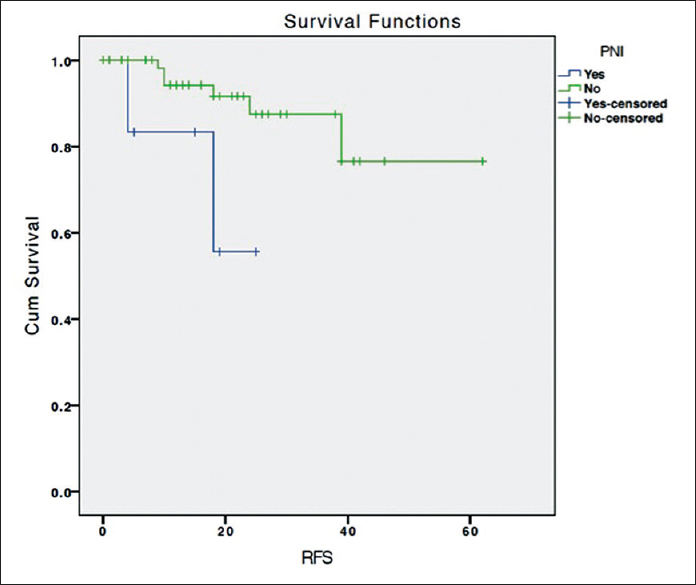 Factors influencing the recurrence-free survival (RFS), including the soft adverse factors, were analyzed. Results: Of the 332 OSCC patients, 70 patients satisfied the eligibility criteria and were included in the study. Majority of them were men (54%), with a mean age of 59 years. All of them underwent surgery and a few received adjuvant treatment (n = 9). PNI was seen in 9% (n = 6) of the cases, median DOI was 6 mm, lymphovascular emboli was seen in only one patients. PNI was the only soft adverse factor, which influenced the RFS on univariate and multivariate analysis. Conclusion: In the present study, PNI seems to be an important soft adverse factor, which influences the RFS. Adding adjuvant radiotherapy may benefit these patients. Prospective studies are needed to further evaluate the need for adjuvant treatment in presence of soft adverse factors, especially PNI, in early OSCC to prevent recurrence. Introduction: Oral squamous cell carcinoma (SCC) is the most frequent head and neck cancer. The metastatic dissemination of these tumours usually occurs through the lymphatic system. The presence of occult lymph node metastasis is the most important prognostic factor. The high incidence of occult lymph nodal metastasis is a strong argument for the indication of elective neck dissection. However, there is a high percentage of patients who do not have metastasis in the pathological exam (pN0). 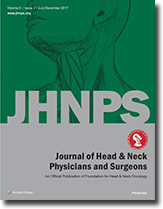 Taking a homogenous group of patients all of whom received primary surgical treatment, at the same institution without prior radiotherapy or chemotherapy, applying stringent patient selection criteria, and standard pathological evaluation methods across the group, this study aims to establish predictors of cervical node metastasis in squamous carcinomas of the oral tongue. Result: During the study period, a total of 112 patients (98 males and 14 females; Mean age 49.7 years (range 15-70)) underwent resection of the primary tumor with SOND for N0 lymph node status of neck. A total of 1489 lymph nodes were analyzed in this study. Occult metastasis was found in 26 patients (23.2%). T-stage 4 was found to be a statistically significant predictor of occult lymph node metastasis in a cN0 neck. (95% CI, p-value 0.02). There was no correlation between gender, tumor thickness, and tumor differentiation and occurrence of occult metastasis. Discussion: Controversy exists over management of the neck in patients with cN0 oral SCC. As is evident there is no consistent statistically significant factor that can be attributed as a predictor of occult metastasis in head and neck cancer of the oral cavity. The search to identify reliable and accurate predictor(s) of occult metastases, or approaches to the management of patients with cN0 oral SCC, must continue. In absence of such predictors, keeping the high incidence of occult metastasis in mind, we recommend END in all cases of N0 OSCC. Background: After total thyroidectomy, hypocalcaemia can be transient or permanent. Most of the patients are being prescribed long term calcium supplementation despite preserving parathyroid glands. We have tried to study the various calcium homeostatic factors to predict the long term calcium levels in differentiated thyroid carcinoma following total thyroidectomy. Method: Study was conducted in a tertiary care centre and a total number of 28 patients of differentiated thyroid carcinoma were retrospectively analysed who underwent surgery from 2013 - 2015. Post surgery patients were given thyroxine and calcium supplementation with regular monitoring of thyroid function test and serum calcium. Serum Parathormone(PTH) levels were recorded after minimum of one year of completion of surgery. Results: Out of 28 patients, 26 patients have serum parathormone within normal range (15-65 pg/ml). Only two patients have low serum PTH values (<15pg/ml). Total number of 23 patients are taking calcium supplementation out of which 21 patients have normal parathormone value. None of the patients without calcium supplementation have low parathormone levels. Conclusion: Our study reveals optimum calcium homeostasis in patients undergoing total thyroidectomy. A long term follow up of these patients is required so that many patients with normal PTH levels may not require calcium supplementation. Thyroglossal cyst is formed from the remnant of thyroglossal tract around 8th–10th weeks of gestation. Thyroglossal cyst is the most common congenital mass found in neck midline. Development of carcinoma in thyroglossal cyst is rare, with an incidence of 0.7%–1.0%. Nearly 90% of the malignancies developing in thyroglossal cyst are thyrogenic in origin arising from the ectopic thyroid tissue. Squamous cell carcinoma accounts for <1% of all thyroglossal cyst malignancies. Thyroglossal cyst carcinomas of thyrogenic origin are managed with Sistrunk procedure along with thyroidectomy. Thyroidectomy is recommended because thyroid carcinomas, especially papillary carcinomas, are multifocal and multicentric. 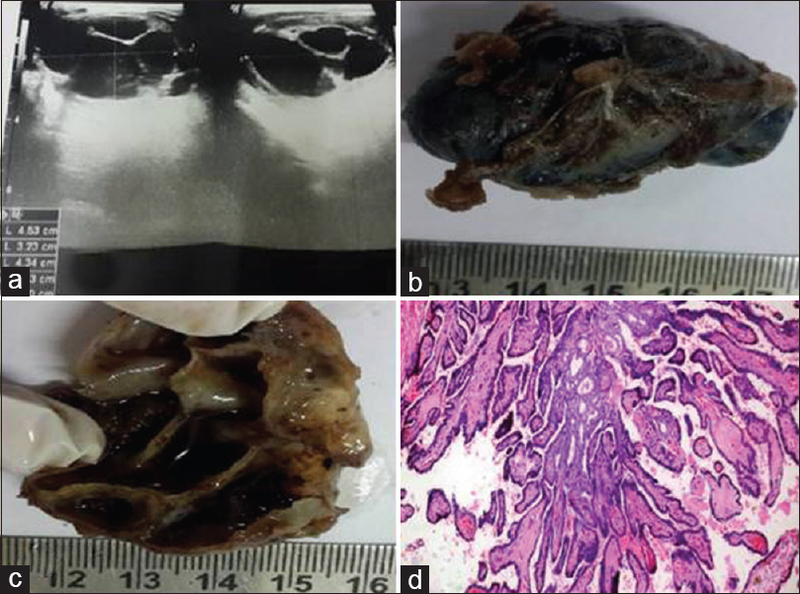 Thyroidectomy is not required in thyroglossal cyst carcinomas of nonthyroid origin. 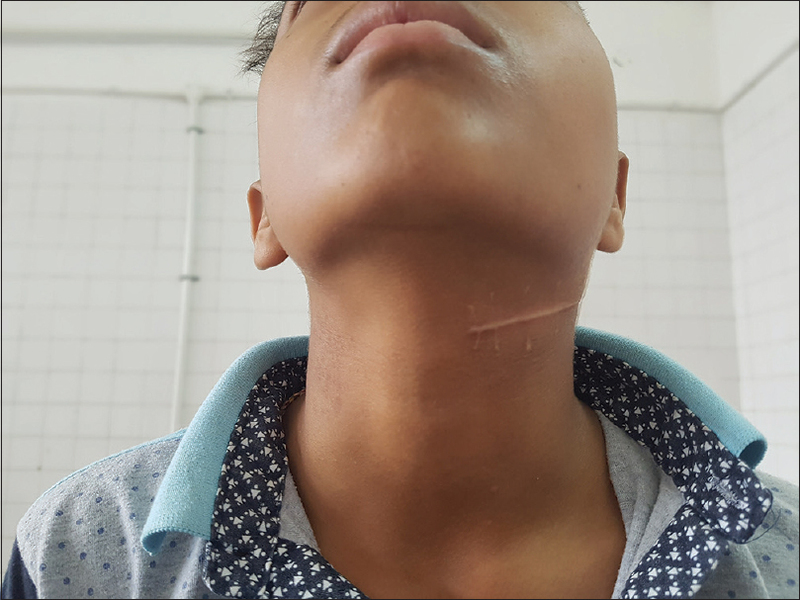 We report two cases of thyroglossal cyst with incidental finding of papillary carcinoma of thyroid origin due to their rarity with a review of literature. Carotid body tumors are rare neuroendocrine tumors derived from the extra-adrenal paraganglioma of the autonomic nervous system. Very few cases have been reported in literature in the pediatric age group <14 years of age. We present our experience in managing a Shamblin III carotid body tumor in a 13-year-old boy who underwent an unsuccessful attempt at excision at another hospital. Surgical excision of the tumor along with ligation of the internal carotid artery was done without any postoperative neurological sequel. 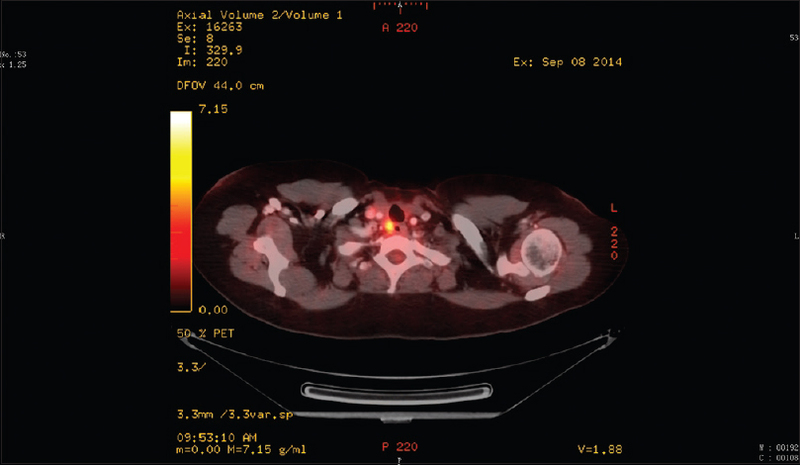 The tumor on the contralateral side was being managed conservatively with serial follow-up. Parathyroid cyst causing vocal cord palsy is extremely rare. 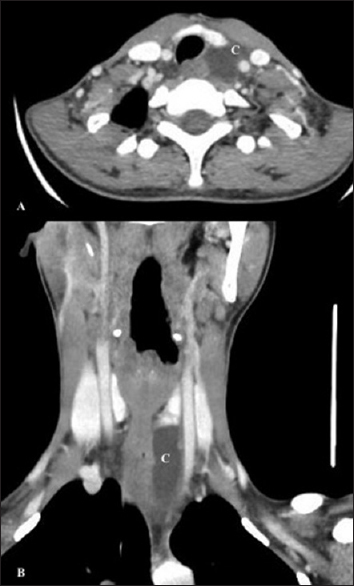 The youngest case of parathyroid cyst causing compressive recurrent laryngeal nerve palsy is reported. The timely surgical intervention resulted in complete recovery of vocal function. Difficulty in diagnosis is highlighted and early reported cases are discussed.